If you are looking for a way to furnish your garden or patio, our teak garden furniture sets are the perfect option. Our sets have been put together to give you the very best in value and come in a variety of shapes and sizes, so there is something for everyone. Teak furniture is a great addition to your garden that will last you many years. It never goes out of style and is high end in terms of design and durability. It can sit through all weather conditions and come out the other side. Teak furniture is also very low maintenance. You never have to apply oil to it or do anything else to keep it looking good, just wash the furniture with mild soap as needed. The teak will naturally change in colour over the years, but it will never affect the quality of the material. Whether you want a teak garden furniture set that is round and accommodate a few people or longer, rectangular tables that seat more, there are many options available to consider. Our large oval double extending table expands to 3m in length and seat 12. 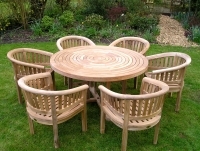 Our exclusive Turnworth teak ring table is available in 6ft, 5ft and 4ft diameters, providing very attractive garden furniture sets for 8 to 4 people. Click on the table you like to find all the chair and cushions options available as part of a set.